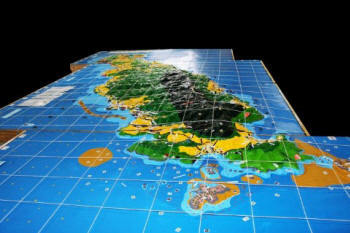 This 1:10,000-scale model (1.5x vertical exaggeration) covering an area of 1,152 sq. km. including marine and terrestrial components of Tobago Island in Trinidad and Tobago was completed in October 2012. Note: The model was produced in the context of the CTA-funded project “Promoting participatory ICTs for adding value to traditional knowledge in climate change adaptation, advocacy and policy processes in the Caribbean and the Pacific”. 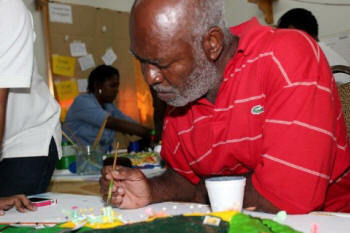 The model was built by a total of 107 residents of Tobago including students and volunteers from the island, elders and invited guests. The map-making exercise was facilitated by Kenn Mondiai, from Partners With Melanesians (PwM), and Kail Zindapan from PAFID, Philippines. The event was organized by Caribbean Natural Resources Institute (CANARI) and benefitted from additional support provided by UNDP GEF – SGP. CTA supported the participation of delegates from a range of organisations with the objective of building capacity in the adoption and deployment of the P3DM process in the Caribbean. The event has been the first of this kind in the region and contributed to the introduction of participatory three-dimensional modelling (P3DM) in the Caribbean. P3DM is a tool that can be used across small island countries to facilitate effective participation by local communities and other stakeholders in the identification of specific policies and actions needed to address the impacts of climate change and extreme climatic events. The P3DM process favours the recognition of the value of traditional knowledge, increases capacity, facilitates coordination and collaboration across sectors, and builds buy-in for implementation of plans for resilience to climate change. The initiative has been implemented by the Caribbean Natural Resources Institute (CANARI), the University of the West Indies (UWI), the Tobago House of Assembly (THA), Division of Agriculture, Marine Affairs, Marketing and the Environment (DAME) and the Partners with Melanesians (PwM). The project has been funded by the Technical Centre for Agricultural and Rural Cooperation ACP-EU (CTA) and the United Nations Development Programme and the Global Environment Facility (GEF) Small Grants Programme (SGP). Bobb-Prescott, N. 2014. 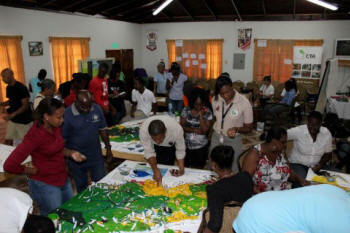 Case study on the use of participatory three dimensional modelling to facilitate effective contribution of civil society in the Caribbean islands in planning for action on climate change. CANARI Technical Report 401, Laventille.